Idaho Botanical Garden: Spotlight - The Boys on the Swing Sculpture has Arrived! Spotlight - The Boys on the Swing Sculpture has Arrived! The ‘Boys on a Swing’ has a new home! The sculpture was placed in the Children’s Garden on November 3rd. 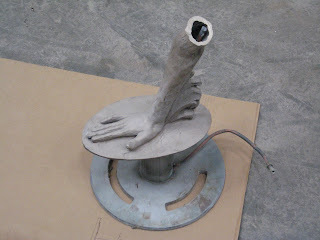 The sculpture was removed in pieces from the Boise Towne Square Mall. The plight of the sculpture originally came to our attention when Truman and Jeanne Keith, Action Jackson, Roosevelt Elementary and other loyal supporters of the Idaho Botanical Garden made it their mission to convince Pacific Steel & Recycling and Tim Woodward at the Idaho Statesman that the sculpture should be given to the Idaho Botanical Garden. The Idaho Botanical Garden would like to thank the many businesses, organizations and individuals that contributed to the sculpture’s restoration and installation at the Garden. The sculpture was restored and welded back together by Dirk Anderson, Anderson Foundry, with the help of Borah High School student, Rebecca Harvey. 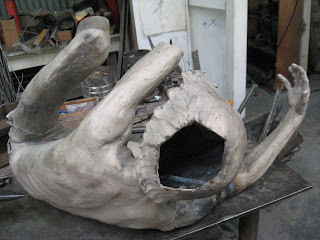 The sculpture was taken apart and then put back together piece by piece during the restoration process. FarWest Landscape and Garden Center designed and constructed the pool surrounding the sculpture. Bart’s Backhoe Services completed the construction grading and excavation work. Quality Electric installed the electricity for the fountain. Horizon Supply and After Dark Landscape Lighting provided materials and installed the lighting. 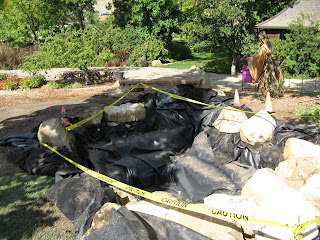 A portion of the sandstone surrounding the pool was donated by Gerhard Borbonus Landscaping. In addition, we received funding for the project from individuals, the Laura Moore Cunningham Foundation, and Pacific Steel and Recycling. Come by and see the newest addition to the Children’s Garden. The ‘Boys on the Swing’ fountain looks truly amazing in its new location and is just waiting to be enjoyed by visitors for many years to come. Update: Check out the Idaho Statesman's article on the Boys on the Swing.